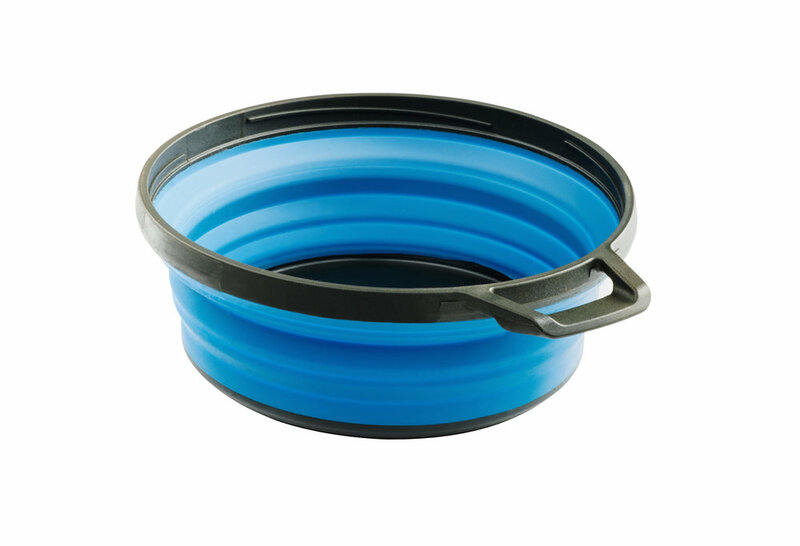 Sturdy nylon rim and base maintain their form to prevent unexpected sloshing or spills. Convenient handle means this bowl is easy to hold and carry. The nFORM Ultralight System has taken the unique needs of fast and light backpacking and built a system of solutions that defy the notion that ultralight means making sacrifices. With a penchant for packing it in, the Pinnacle Soloist somehow sneaks everything you need to cook, clean, eat, drink and store into just 10.9 oz. (309 g) while still leaving room for a stove and 230 g fuel canister inside. Better yet, the interior is coated with outdoor-exclusive, conduction-enhancing, scratch- and abrasion-resisting Teflon® with Radiance Technology non-stick for fast, even cooking and even faster cleanup. Time, comfort, efficiency, performance and ultra-light weight in a system built just for you and the way you get outdoors, the Pinnacle Soloist packs faster, climbs higher and hikes through any trail, but best of all it really cooks. Crushproof, heat-resistant, nylon lid includes an integrated strainer and doubles as a Sip-It lid for the mug. Handy spout makes it easy to pour water for rehydrating meals or brewing coffee or tea. The nFORM Ultralight System has taken the unique needs of fast and light backpacking and built a system of solutions that defy the notion that ultralight means making sacrifices. Thanks to its incredible capacity for nesting, the Pinnacle Dualist includes insulated mugs, bowls, a pair of folding fork-spoon hybrid utensils, strainer lid, sink sack, handy measurement graduations and a 1.8 L boiler while still leaving room for a stove and 230 g fuel cartridge inside. Better yet, the interior is coated with outdoor-exclusive, conduction-enhancing, scratch- and abrasion-resisting Teflon® with Radiance Technology non-stick for fast, even cooking and even faster cleanup. Time, comfort, efficiency, performance and ultra-light weight in a system built for you and a friend, the Pinnacle Dualist really packs it all for you. Beyond the bulk and burden of basic ultralight backpacking, the Minimalist stands alone. The peak of reductive efficiency, the minimalist has no handles to hack off, no bowls to leave behind and no coatings to add unnecessary fuss or weight. Quite simply, the Minimalist is as close as you can come to not carrying anything at all while still bringing everything you need. Beyond fast + light, beyond the bleeding edge, beyond belief: the Minimalist. The nFORM Ultralight System has taken the unique needs of fast and light backpacking and built a system of solutions that defy the notion that ultralight means making sacrifices. 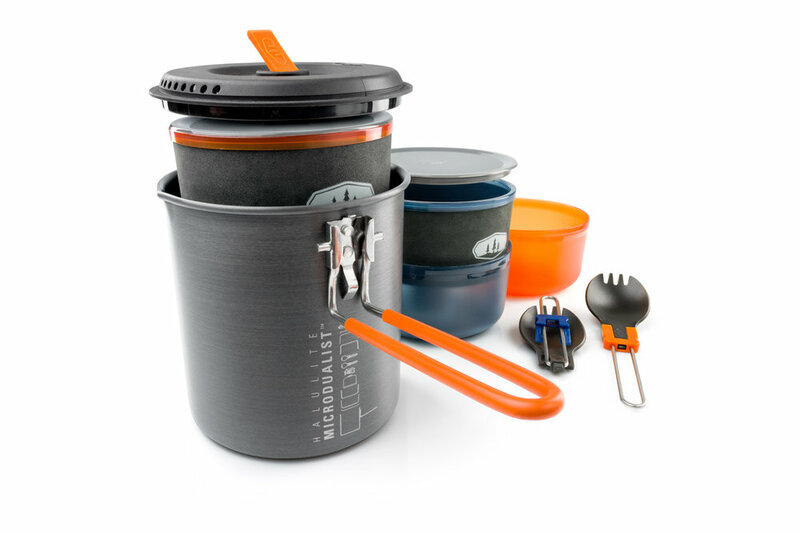 Thanks to its uncanny ability to conceal things in its interior, the Halulite MicroDualist includes insulated mugs, bowls, a pair of folding fork-spoon hybrid utensils, strainer lid, sink sack and a 1.4 L boiler with handy, molded-in graduations while still leaving room for a stove and 110 g fuel cartridge inside. And since it is fully formed before hard anodizing, the surface is garnet-hard and incredibly-conductive, for fast boils and fuel-saving snow melts without worry of scratches or anything else getting in the way. Time, comfort, efficiency, performance and ultra-light weight in a system built for you and a friend, the Halulite MicroDualist is fast and focused, just like you. The nFORM Ultralight System has taken the unique needs of fast and light backpacking and built a system of solutions that defy the notion that ultralight means making sacrifices. With its clever nesting kettle design which conceals a bowl, insulated mug, sip-it top and folding hybrid fork-spoon while still leaving room for a 110 g fuel cartridge, the Halulite Ketalist has done all your packing for you. And since the 1 L kettle design is fully enclosed and pours like, a kettle, it makes quick work of your favorite rehydrate meals. The Halulite Ketalist packs fast, boils faster and climbs like nothing else out there- time, comfort, efficiency, performance and ultra-light weight in a system built just for you and the way you get outdoors. The nFORM Ultralight System has taken the unique needs of fast and light backpacking and built a system of solutions that defy the notion that ultralight means making sacrifices. Thanks to its incredible capacity for nesting, the Glacier Stainless Dualist includes insulated mugs, bowls, a pair of folding fork-spoon hybrid utensils, strainer lid, sink sack, handy measurement graduations and a 1.8 L boiler while still leaving room for a stove and 230 g fuel cartridge inside. And since both boiler and lid are made of rugged, highly-conductive 18/8 (304) stainless steel, you are free to cook over the campfire, coals or just about any other heat source. Time, comfort, efficiency, performance and ultra-light weight in a system built for you and a friend, the Glacier Stainless Dualist really packs it all for you. In the realm of rugged outdoor kitchenware, nothing comes close to the durability of Glacier Stainless’s premium 18/8 stainless steel construction. With a brilliant, rust-proof finish and the strength that only steel can provide, Glacier Stainless is the material of choice for cooking over coals or camp fires. Of course, our premium 304 (18/8) stainless steel construction is also fully-recyclable, free of BPA , PFOA and Phthalates, and completely dishwasher safe. Easy-packing, nesting design includes stainless steel, folding-handle frypan, pot and bowl, plus a Cascadian™ cup and mesh stuff sack. Stainless steel frypan with folding, locking handle is perfect for pancakes or an egg. The Coffee Rocket is an incredibly clever, one person pour-over coffee maker which collapses to nest inside your favorite mug. Fresh delicious coffee is as simple as filling the grounds cup, snapping on the drip cone, extending the notched legs and setting the Coffee Rocket on top of your favorite mug before pouring in the hot water. In just a few minutes, you have a rich, invigorating brew anywhere. And since it weighs just 2.7 oz. (77 g) and doesn't need a paper filter, it cleans easily and packs effortlessly, so there's no excuse not to enjoy a fresh cup wherever the world finds you. There's nothing more rewarding, nothing more refreshing than the scent of freshly ground coffee floating on the mountain air. Now, with a few cranks of the sturdy alloy handle, you can unlock all of the flavor and aroma of your favorite coffee no matter where you find yourself. The Gourmet PourOver Java Set's clever, expanding silicone cone brews fresh, delicious coffee and yet collapses to just 1" high to travel anywhere. Simply set the filter on top of your favorite container, from a wide mouth water bottle to a small pot, add any brand of #4 filter, grounds and water and voila, eye-opening drip coffee just like home. The convenient cover even doubles as a trivet for the cone when you're done brewing and keeps everything clean during transport. This set is the perfect start to your mornings outdoors for years to come. Adjustable, conical burr, ceramic coffee grinder unlocks the flavor of your favorite beans better than blade-style grinders. Sturdy, alloy grinder handle nests and locks in place for easy packing. Narrow grinder silhouette fills easily from the top while the integrated cup captures all of the freshly ground goodness below, keeping everything clean. Collapsible drip cone holds #4 filter to brew 1-12 cups of coffee. Sturdy, silicone bellows design collapses into a 1” high, 5.6” diameter disc. Unique flange helps center drip cone over mugs, cups and wide-mouth bottles for stable, spill-free brewing. Transparent drip cone base helps prevent over-filling. Stay connected with GSI Outdoors by following them on Facebook, Instagram and Twitter.